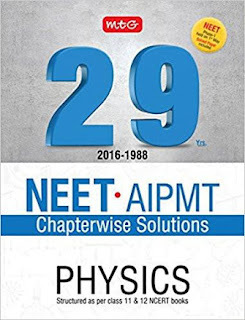 The present book containing collection of previous years’ chapterwise questions asked in CBSE AIPMT and NEET has been divided into 32 chapters namely Physical World & Measurement, Motion in One Dimension, Motion in Two & Three Dimensions, Laws of Motion, Work, Energy & Power, Rotational Motion, Gravitation, Heat & Thermodynamics, Oscillations, Waves, Electrostatics, Current Electricity, Thermal & Chemical Effects of Current, Magnetic Effects of Current, Magnetism, Electromagnetic Induction, Alternating Current & Electromagnetic Waves, Ray Optics & Optical Instruments, Electrons & Photons, Atomic Physics, Nuclear Physics and Solids & Semiconductors Devices. The book contains last 29 years’ (1988-2016) Chapter wise solutions of Physics questions asked in CBSE AIPMT and NEET. The book covers all the topics that are a part of NEET Physics syllabus. All the previous years’ objective questions have been covered chapterwise along with their answers and solutions. Authentic, analytical and augmented solutions have been provided for all the questions. Hints and solutions have been given at the end of each chapter. Solved papers AIPMT 2015 and NEET Phase I& Phase II2016 have been given at the end of the book to help aspirants get an insight into the current examination pattern of NEET.